We work to understand your business and what you want to achieve with video. Working with you, we find the types of corporate videos that will be most affective. We find he best people to bring your video to life. From production to post production, the selected team will be the right fit for you! And, action! Your video is filmed, editing and delivered to you. We make sure it's of high quality and within budget. Video production in Sydney is our specialty. Welcome to Redefined Media, where we can help you create amazing videos that speak louder than words. We have seen a number of businesses struggle becaue they didn’t know how to sell their business. They chose to create a website that was filled with text and it was unable to connect with their consumers. We want to see businesses succeed and that is why we do what we do. 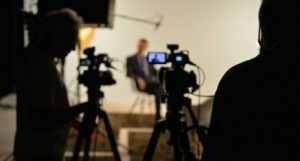 We connect with production companies in Sydney to supply our customers with top quality corporate videos. Video production Sydney is a fast becoming a bustling industry when it comes to corporate video. Production companies across Sydney are now producing top high quality content for their customers. We provide guidance to businesses to show them what videos can do, why they should be used, and how to produce an amazing video to suite a variety of purposes. For more information please click here. You see these types of corporate videos more often than you think. They’re the new way to communicate to your customers or staff and they are highly effective! Who wants to read through a manual and paragraphs of information that don’t really explain things very well? With video production company, you can produce a training video that turns a boring word document full of tedious and hard to understand instructions into an entertaining work of art that teaches and explains. Because it’s a video, you can post it, share it, send it or tweet it as many times as you want! Have you ever asked someone what they think of a person, place or thing? We ask for the opinions of the people around us because we understand that we can learn from other people’s experiences and either take the path they took, or choose a different route based on their experiences. If you have happy customers it means they’re likely to be saying great things about you to their friends and family. This isn’t enough though – you need your happy customers to be boasting about you not only to their friends and family, but other potential customers of yours. Imagine if you could do this right from your own website! With a testimonial video, you can. Putting a testimonial video on your website means that you’re promoting someone else promoting you. A bit confusing right? This new way of marketing your brand is proving extreemly popular for businesses. People believe what other people say, not what a faceless corporation says. Generating excitement and awareness for a particular event, product or service that you are offering can be difficult. In this modern world with a serious case of content overload, it’s hard to cut though the noise and get people to listen to what you have to say. This is why the medium of video is becoming so popular – because it’s so powerful! Producing a promotional video what you do, whether it be; a product you sell, service you provide or simply an event you host, a promotional video can be so affective in generating some excitement, anticipation and general awareness on what you have to say or show. The above are our most popular video types however this doesn’t mean this is all we can offer you. Video production is an extreemly diverse industry and provides businesses large and small great possibilities. Whatever your idea and whatever your budget, we’re able to cater for your needs. Click here to read more about the benefits of our videos. We will take the time to understand your business and develop the most cost effective approach to your brief. With the use and expert knowledge of the most advanced software available, your products and services can be presented and promoted in a way you never thought was within reach. Please get in touch with us to see what we can offer you. If you’re in Sydney and need a video, a music video, or a TV commercial created, we have the writers, artists, and producers on staff to make it happen. We anticipate your needs and understand the importance of professionalism when creating a video. You don’t have to know how to create a video – you simply need to know why having a video for your business is so important. There are many ways for you to use a video to market your business and convert more site visitors to customers. When seeing is believing, a video gives people with the proof needed to choose YOU over your competition. Using the natural beauty of Sydney, the Team at Redefined Media works to get your next video, photo shoot, or virtual media product looking it’s absolute best! As a production company that works mostly along site other businesses, on this site you’ll find various resources from production companies across Sydney and Australia. It’s entertaining. People like video for the same reason that television made radio programs obsolete. It is far more exciting to see the Lone Ranger in action than to merely hear his horse’s hooves pounding, the dialogue, and the gunfire. We are visual creatures and we like to see things. Not only do people like to see things, they like to see them in action. A movie is far more interesting than is a slide show. Talkies soon superseded silent films. So it is with video advertising. Your product comes to life while you tell about it, demonstrate it, and explain how it will improve the life of the consumer. So many creative effects can be brought into play when you make a video clip of your business. If your business is dealing in antiques, part of your video could be shot in sepia tone to enhance the concept of age. The video can switch between color, sepia, or even black and white for dramatic effect, which will definitely grab the attention of the shopper. It’s realistic. If a person is shopping for a used car and they find an ad that contains a video clip of the car, they are far more likely to be interested when they can see all around the car inside and out, and even hear it run. A used car dealer would be wise to select a few of his choicest cars, make video clips of each of them to post on his website. A look under the hood with the engine running, and around the back at the tailpipe to show that the car doesn’t smoke, will entice the shopper to come in and take the car for a test drive. If you are an novelist, a video clip of you sitting in your favorite chair with an inviting fire in the fireplace and a cup of cocoa on the end table beside you while reading an cliffhanger excerpt from your book will draw potential readers into your story, compelling them to make the purchase. If your business is a resort in an obscure location, showing a video of the resort with all its amenities, clips of places of interest to see in the immediate area, and a personal invitation from the front desk clerk (the person whom the visitor will actually meet upon arrival), will attract the vacationer who may have never heard of your resort otherwise. They experience first hand. Whether it’s a product to sell, a service to perform, or a destination vacation, showing a video of your business will draw the potential customer into the picture. Video helps the viewers to place themselves in the picture. They can see themselves using the product, enjoying the vacation resort, or interacting with the professional service provider. If you are a doctor advertising your specialty, the potential patient will be able to see your mannerisms, hear your voice, and decide whether or not you are the type of person that they feel comfortable with. © 2019 Redefined Media. All Rights Reserved.